Long before Edith Piaf sang "La vie en rose," her predecessors took to the stage of the belle epoque music hall, singing of female desire, the treachery of men, the harshness of working-class life, and the rough neighborhoods of Paris. Icon of working-class femininity and the underworld, the realist singer signaled the emergence of new cultural roles for women as well as shifts in the nature of popular entertainment. Chanteuse in the City provides a genealogy of realist performance through analysis of the music hall careers and film roles of Mistinguett, Josephine Baker, Fréhel, and Damia. Above all, Conway offers a fresh interpretation of 1930s French cinema, emphasizing its love affair with popular song and its close connections to the music hall and the café-concert. 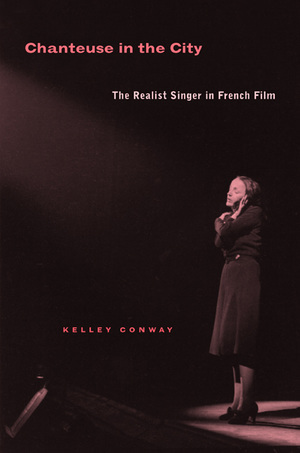 Conway uncovers an important tradition of female performance in the golden era of French film, usually viewed as a cinema preoccupied with masculinity. She shows how—in films such as Pépé le Moko, Le Crime de Monsieur Lange, and Zouzou—the realist chanteuse addresses female despair at the hopelessness of love. Conway also sheds light on the larger cultural implications of the shift from the intimate café-concert to the spectacular music hall, before the talkies displaced both kinds of live performance altogether. Kelley Conway is Assistant Professor of Communication Arts at the University of Wisconsin, Madison.